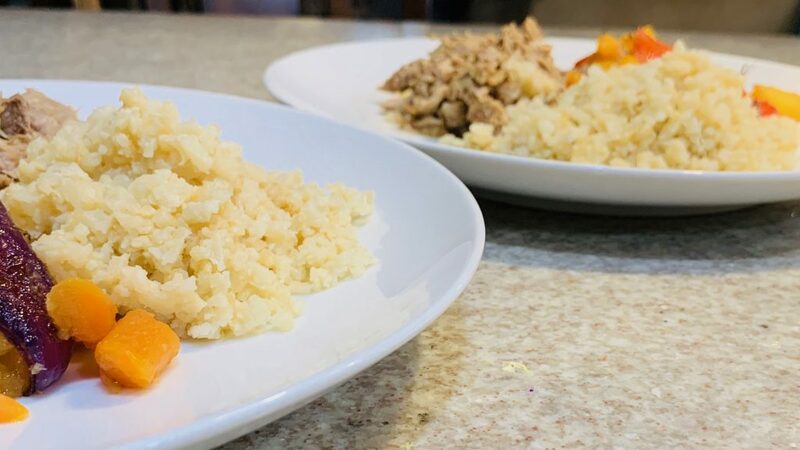 With only a few ingredients, Coconut Cauliflower Rice comes together fast. The warm ginger with the sweet coconut makes for one flavor packed side dish. Cauliflower rice has become one of my new favorite side dishes. It cooks up quick and is easy to flavor depending what kind of meal you’re having. I usually buy mine in the freezer section, which makes it even easier to use on those busy nights. Sometimes I’ll have extra raw cauliflower from other recipes or maybe a vegetable tray. 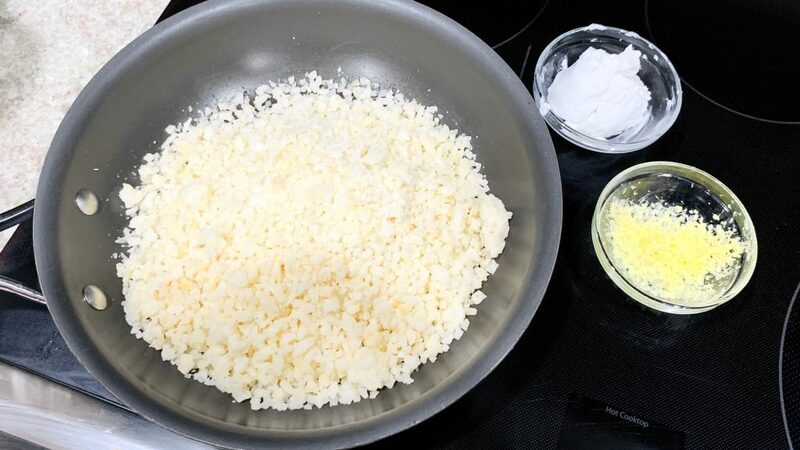 I’ll process the raw cauliflower in my food processor and store it in the freezer. A great way to preserve those extras. 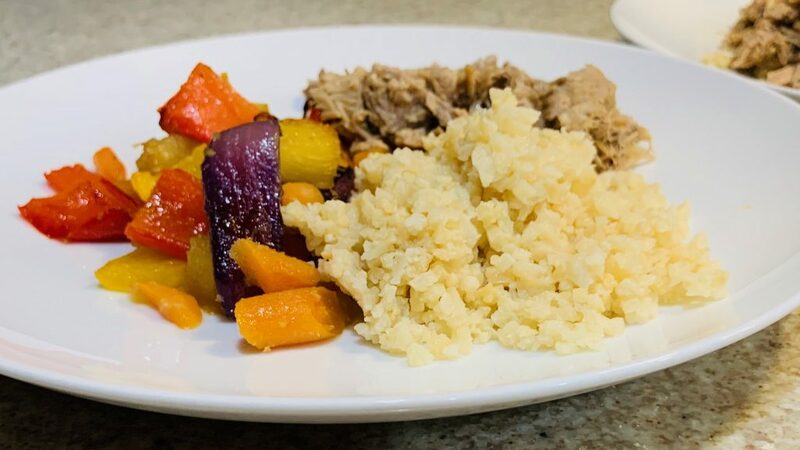 This recipe for Coconut Cauliflower Rice uses coconut cream, which you can get from canned coconut milk. Don’t shake the can, just open it and the coconut cream is on the top. You can save the coconut milk underneath for something else. Another option is to use boxed coconut milk, although this doesn’t have the cream. When using the boxed coconut milk, I like to add coconut oil as well. 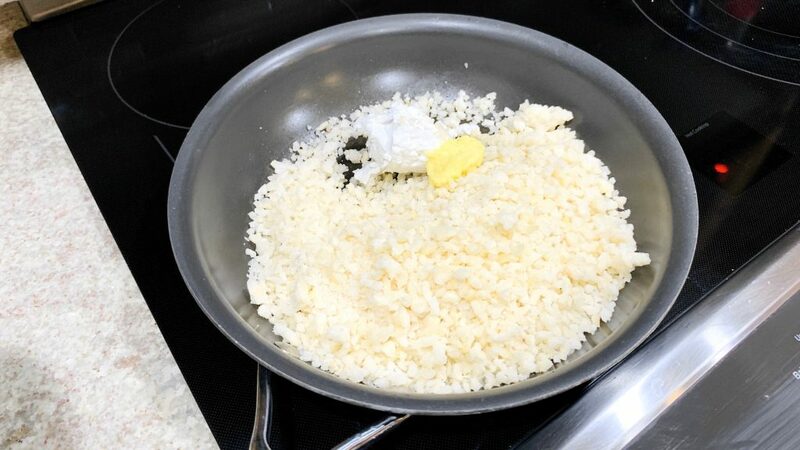 You’ll need more of the milk and just let it simmer until it’s all absorbed by the cauliflower rice. The coconut butter gives a big flavor punch. You can buy it or make your own out of unsweetened coconut. Coconut Cauliflower Rice with Ginger is extra special because of the ginger. I keep peeled fresh ginger, cut in 1 inch chunks, in the freezer to pull out when a recipe calls for fresh ginger. No need to thaw it out, just grate it on a zester/microplane straight from the freezer. You can also use powdered ginger, but it’s more potent so don’t use as much. 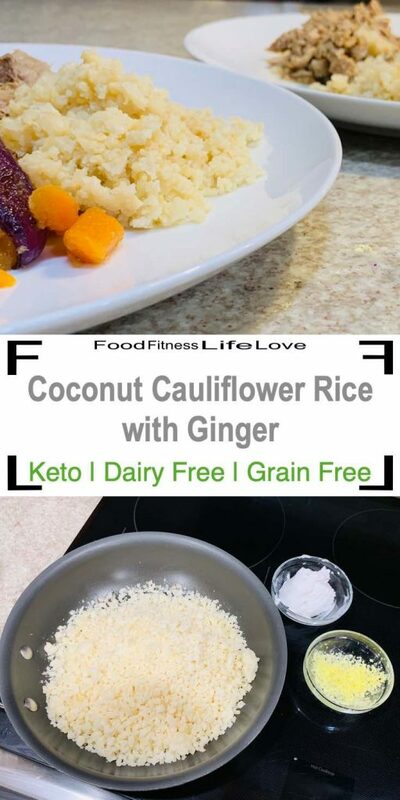 Cook all the ingredients in a skillet until the Coconut Cauliflower Rice is flavored and cooked through. Add salt to your taste and you’re done. It’s as simple as that. This is my go to side when I’m making my Pressure Cooker-Instant Pot Kalua Pork. Here I also served it with Oven Roasted Hawaiian Vegetables to make a delicious meal. Note: I’ve also made this with coconut oil (1 Tbsp) and coconut milk (1/3-1/2 cup) instead of the coconut cream. Just simmer until all the liquid is absorbed. 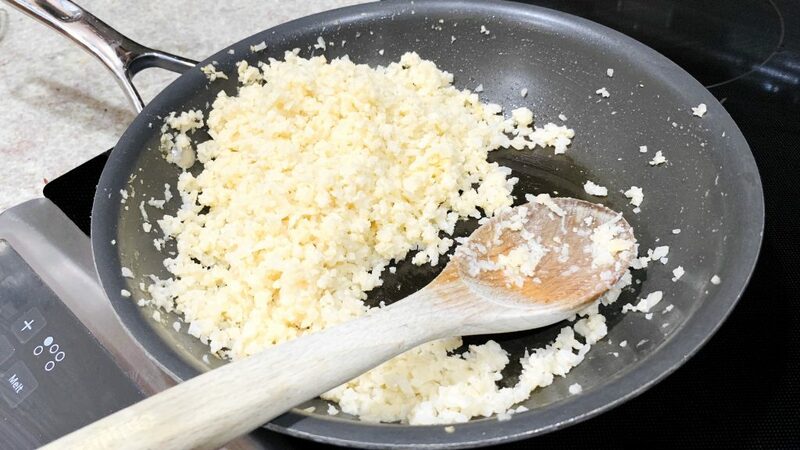 Add the cauliflower, coconut cream, grated ginger and coconut butter to a skillet over medium heat. Stir occasionally to get all the ingredients thoroughly combined. 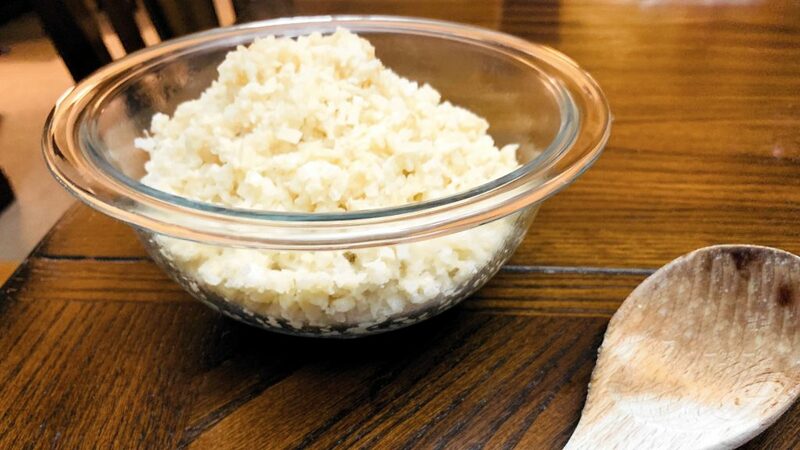 Continue for 8-10 minutes until the cauliflower rice is cooked through. Add salt to taste and serve.